For the best beaches, clear waters and fine, powder-like sand, learn Italian in Sardinia! Our school in Sardinia is located in the beautiful town of Alghero, on the sparkling Riviera del Corallo, considered by many to be the finest coastline in the Mediterranean! In addition to many beautiful beaches, Alghero also has a picturesque old town, full of colourful side streets and markets where you can practice the Italian you have learnt in class! Learn Italian in Sardinia, and you’re sure to eat well – the locals favour hearty, rustic dishes made to old Sardinian recipes. You’ll find classics such as freshly made minestrone and ravioli, plus regional specialities like malloreddus, a delicious gnocchi dish! Alghero is also a lot of fun at night, when the town’s fashionable clubs and restaurants fill with locals and holiday-makers alike. Whilst you’re in Alghero, don’t forget to take a boat trip along the coast to Neptune’s Grotto, a series of caves straight out of a Sardinian pirate story! 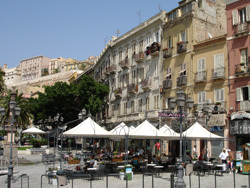 Our Italian language school in Alghero is situated on a quiet street in the scenic old town. After your Italian lessons, enjoy a stroll around charming medieval streets, or visit the nearby marina and gaze out upon the azure Mediterranean. You can choose from a wide range of quality Italian courses at our school, taught by fully qualified and experienced native Italian teachers. Regardless of which Italian course in Alghero you decide to take, the maximum class size will only ever be eight students. With such small classes, you’ll receive lots of personal attention from teachers, who can spend lots of time helping you to improve your Italian! The Intensive Italian course at our school consists of 20 Italian lessons per week. Our school’s Combined Course supplements these 20 group lessons with five Private Lessons every week, giving you even more individual attention! For total control over the pace and content of your course, choose a program made up entirely of Private Lessons. As well as Italian lessons, the Italian and Culture program also includes talks and trips, giving you fascinating historical background on Alghero and Sardinia. You might prefer to learn about the Italian culture by taking additional classes in wine tasting or Italian cookery. Sample choice wines in one of Alghero’s finest restaurants, or join the restaurant’s chef in finding local produce at the market, creating tasty dishes and then enjoying the end product! Really get to know this enchanting part of Italy with our school’s Evening Course. During the day you can explore Sardinia, before attending lessons in the late afternoon / early evening. Lessons focus on practical, conversational Italian, language which you’ll then practice with locals in Alghero in the second half of the session. If you choose host family accommodation, you can even live with the locals! Using your Italian all the time, you’ll soon notice an improvement in your language skills. Families are very carefully selected by our school, and provide you with breakfast every morning (further meals are available on request). It is also possible to live in a shared student apartment, with international students from all over the world! Or enjoy your own space in an independent apartment. Single and double rooms are available in both shared and independent apartments. Our school in Alghero collaborate with a local sport activities organisation which offers activities such as sailing, surfing, wind-surfing, kite-surfing, scuba-diving, tennis and horseback riding! These activities are not included in the course price and the additional charges will be payable directly on arrival. The school do advise that you advise at the time of booking whether you are interested in any of these activities as spaces are very limited! Average score for our school in Alghero based on 10 previous client reviews. Very Good teachers. Friendly. Nice atmosphere. Well structured lessons. Nice host lady. Close to school. Everything in Alghero was great! The school is very small, the teachers excellent, and the atmosphere very familiar (director as well) , felt like home. Only great things to say! Great host, very warm and nice. Appartment perfect with a sea view. Tutto a posto e perfetto!!!!! Very competent teachers. Fantastic accommodation! Nice house, good food, nice host. Could be more levels at school and [we would benefit from more] exercises in pronunciation. Enjoyed the course very much. Tutors were good, friendly and willing to help. Groups in lessons were small, in my class we were only 4 students, only italian was spoken and therefore I learned a lot. I shared a huge apartment right in the center of the old town: The living room was looking out at the harbour and my room was looking out on the central piazza. It was just perfect! The course was very well managed by the school, the teachers are very experienced and I learned more than I had expected. I actually did not want to leave! The accomadation was very comfortable and the hostess was very friendly, caring and made me feel at home. Very good course, with excellent teachers and very nice people. The accommodation was excellent, my host family were great with a very nice house. The ambiance in the school was great and the teaching excellent. The accommodation was very close to the school and the historical part of the city, it wa very safe and clean. I would recommend this school to everyone who is interested in learning Italian and having a great week. Alghero – a Sardinian Paradise!